Ohio State Buckeye fans can attend 20+ sports for FREE! 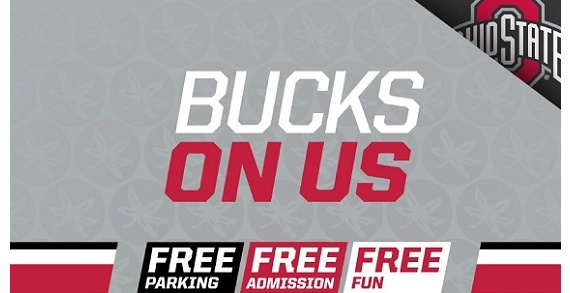 It’s the Bucks On Us and features FREE admission to regular-season home events for select sports. Visit OhioStateBuckeyes.com/BucksOnUs for details and to plan your next outing with the Buckeyes! Bucks On Us FREE admission for regular-season home events include the following sports cross country, fencing, field hockey, men’s and women’s golf, men’s gymnastics, women’s ice hockey, women’s lacrosse, pistol, rifle, rowing, men’s and women’s soccer, softball, men’s and women’s swimming and diving, synchronized swimming, men’s and women’s tennis, track and field and men’s volleyball. Regular-season home events for Bucks On Us sports are FREE for all fans! Get in the house … on the house. Bucks On Us. Free parking. Free admission. Free fun.